Gerbils are cleaver little creatures who are always looking for a means of escape. Glass aquariums with tight-fitting lids make safe and secure habitats, and they give you an unobstructed view of your pet from all sides. Plastic habitats with connecting tubes and built-in toys look like a lot of fun, but constant scratching clouds the plastic, and gnawing on the connections can eventually provide a means of escape. In addition, these types of habitats are much more difficult to keep clean. It only takes a few minutes to turn an aquarium into a home for your pet gerbil. Choose an aquarium the right size for the number of gerbils you plan to keep. Keep one or two gerbils in a 10-gallon aquarium, three in a 15-gallon aquarium, four or five in a 20-gallon aquarium and six in a 30-gallon aquarium. Cover the bottom of the aquarium with 2 inches or more of shredded aspen bedding. Add bits of clean shredded paper or hay for your gerbil to use to build a nest. Hang a water bottle from the sides of the aquarium. Watch your gerbil the first time he drinks to make sure that the drip tube is at a comfortable height. If you have baby gerbils, you may need to raise the bottle as they grow. Provide your gerbil with several toys. These busy little animals are curious and like to explore new things. Sturdy toys designed specifically for hamsters and gerbils are best. They will enjoy an exercise wheel with slats close enough together that their feet don't get caught. They will also enjoy a rock that they can climb to observe the world around them. Cover the gerbil habitat with a screen aquarium cover and secure it in place with aquarium lid clips.  When you plan to house more than one gerbil in an aquarium, choose them from a single litter. 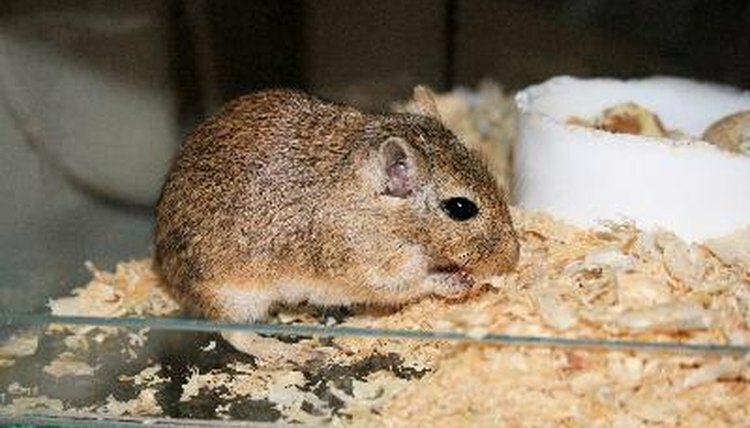 Adult gerbils are likely to fight when introduced to each other.  Aspen makes the best bedding for gerbils, but you can also use other types of hardwood shavings. Avoid aromatic woods, such as pine and cedar, which can irritate your furry pal's eyes and skin.